Search for cheap hotels in Kyrenia from budget to luxury. 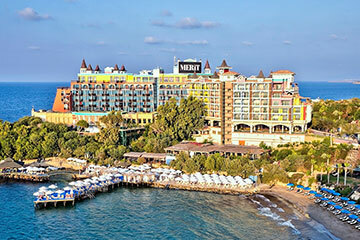 Use our booking tool to compare and book Kyrenia hotels at discounted prices. Kyrenia is the main town playing important role in the tourism industry of Northern Cyprus, the Turkish side of Cyprus Island. There are world class restaurants for dining out, important tourist attractions to visit, perfect Mediterranean weather and sun-drenched beaches to enjoy. Local people are very friendly, and Turkish hospitality is known all over the world. Discover the tranquillity and calmness of a Mediterranean town in this beautiful corner of the Cypriot coastline. Kyrenia harbour is usually the first stop for many holidaymakers; here you can find cafes and bars lined along the horseshoe-shaped historic harbour, a great place to relax. Then there is impressive Bellapais where you can admire the monastery and the views of Mediterranean coast. 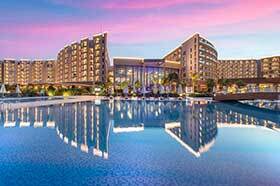 Hotels in Bellapais and Kyrenia harbour are available at affordable prices. For the adventure travellers there are 4 castles in the harbour and majestic Kyrenia mountain range including St Hilarion Castle, Buffavento & Kantara. It is a great base to explore the other places on the island. Of course, Northern Cyprus is not all about this pretty harbour town. Nicosia, Famagusta, Guzelyurt and Karpas Peninsula are also worth visiting. The best way of getting around on the island is hiring a car in Kyrenia. Paragliding: Admire wonderful panoramic views of Kyrenia coastline from high above the ground. Scuba Diving: Why not explore the underwater realm. The warm waters of the Mediterranean makes diving and snorkelling comfortable all-year-round. Walking: the mountain range is a perfect spot for walkers during cooler months. Jeep Safari: It is a great adventure where you can enjoy fantastic views and learn more about the local culture. Visit to a festival: It is home to many festivals during summer months which include Bellapais Music Festival, Zeytinlik Olive Festival, Lapta Tourism Festival and more. CyprusHolidayAdvisor.com is a leading travel site specialising in Northern Cyprus package holidays from the UK airports such as London Stansted, Gatwick, Luton, Manchester, Birmingham to both Ercan and Larnaca Airports for over 10 years. Book your North Cyprus holidays and hotels in Kyrenia and Famagusta online within minutes. © 2019 CyprusHolidayAdvisor.com, Kyrenia, North Cyprus - All rights reserved.